The library keeps on giving and a ‘new’ book often emerges from the open and accessible stacks. This is a wonderful booklet from a Venezuelan gallery/publisher Fototeca from May 1978 with work from the extraordinary photographer Luc Chessex. The book is designed by the enigmatic designer Alvaro Sotillo (the designer of the classic Retromundo by Paolo Gasparini – R TR647. G372 1986). The cover consists of the most amazing black ink image on dark black background. The images are street scenes from Cuba, Puerto Rico, Bolivia, Brazil, Panama, Dominican Republic, Nicaragua, Ecuador and they capture very powerful and authentic feelings from an important time. Predominately they are photographs of children; children with guns. There is always something deeply challenging about imagery of smiling children holding guns. It is no wonder that Luc Chessex often described his work as ‘tropical surrealism’. Luc Chessex was born August 10, 1936 in Lausanne in French-speaking Switzerland and in capturing ‘reality’ he stresses the early influence on his work of his compatriot Robert Frank. In 1960 Luc Chessex emigrated to Cuba where he wanted to show his support for the revolution with his photographs. From 1961 to 1968 he worked as the official photographer of the revolution in the Ministry of Education. For the next four years he worked for the Cuban news agency Prensa Latina travelling around South America: to Nicaragua, Bolivia, Chile, El Salvador and also in La Higuera, where Che was murdered. Luc Chessex was a persistent and exemplary witness of Latin America from this time. His style was very graphic with his diagonal compositions giving a strong suggestion of dynamic movement. His street photographs are intense snapshots of the environmental design of the Latin American cities that he worked in and its people. He shows a genuine love for the people that he is engaging with. This slender booklet ‘Luc Chessex’ consisting of merely twenty pages is wonderfully simple and extremely effective in terms of design. Intriguing and energetic B&W images with simple type and accented with bold yellow pages. In 1975 Luc Chessex like many ‘foreigners’ was expelled from Cuba due to the increasingly totalitarian influence of the Soviet Union upon the Cuban state. From 1978 to 1980 he followed the Red Cross on its missions in Africa. From 1981 to 1989 he was a teacher working at the School of Photography in Yverdon, Geneva, at the Ecole sociale et Pédagogique as well as at the Art School in Lausanne. Since then, he has been traveling around the world and makes photographs in different countries. [A wonderful book with awesome images produced on such bad quality yellowing paper that it really is very upsetting. The ICP library copy is inscribed to our founder Cornell Capa]. 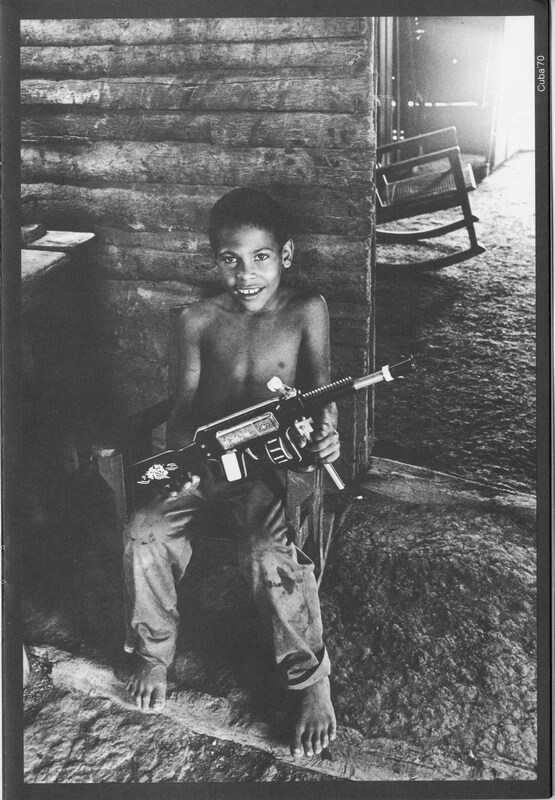 This entry was posted in International, Unpacking the collection and tagged Alvaro Sotillo, Bolivia, Brazil, Children with guns, Cuba, Dominican Republic, Ecole sociale et Pédagogique, Ecuador, Latin America, Latin-American Photography, Luc Chessex, Matthew Carson, Nicaragua, Panama, Paolo Gasparini, photography of children, Prensa Latina, Puerto Rico, Retromundo, Robert Frank, The Latin American Photobook, Venezuela. Bookmark the permalink.